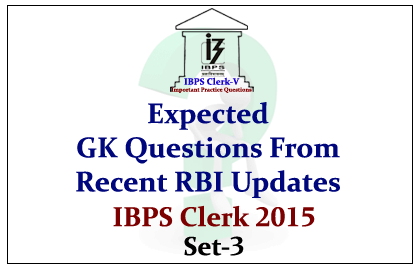 Dear Readers, Important Expected GK Questions from Recent RBI Updates for Upcoming IBPS Clerk V Exam was given here with answers. Aspirants those who are preparing for the examination can use this. 1). Reserve Bank of India has withdrawn the instructions on compensation to banks for detecting counterfeit notes. The compensation was being paid at ________ of the notional values of counterfeit notes detected. 2). The Reserve Bank of India has designated ______ and ______ as India’s top two banks by assets as Domestic Systemically Important Banks (D-SIBs). 3).RBI uses GVA to give its projections nowadays, here GVA stands for _______. 4). After releasing Rs. 100 notes, RBI would soon start issuing Rs. 1000 notes with enhanced security features. The RBI is empowered to issue bank notes of denomination up to _______. 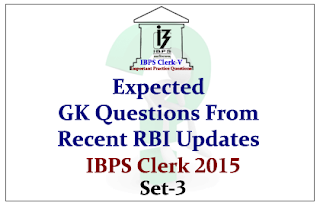 5).What is the current Marginal Standing Facility Rate of RBI? 6).Reserve Bank of India will shortly put into circulation ______ coins to commemorate golden jubilee of Indo-Pak War 1965. 7).RBI has granted in-principle approval to 10 entities for small banks. What is the minimum capital requirement for small banks? 8).Reserve Bank of India has announced that the companies will now be able to borrow up to $ 50 million in ECBs with 3 years maturities and more than $50 million for 5 years maturities. Here the term ECB stands for _________. 9).Who is the head of the High Powered Committee on Urban Cooperative Banks (UCBs) recommended the conversion of UCBs with business size of Rs. 20,000 crores or more into regular commercial banks? 10).Reserve Bank of India has granted in-principle approval for small finance banks license to 10 entities. Which of the following is NOT one among them?